Launched in May of 1813, the brig Niagara was named after the American Fort Niagara, Sister ship to the Lawrence, she had a crew of 155 and was armed with two 12-pounders and eighteen 32-pounders under the command of Captain Jesse Elliott. Commodore Perry transferred his flag to the Niagara upon complete destruction of the Lawrence. From here he regrouped the American fleet and led them to victory. After the battle she provided cover for American troops before becoming a receiving ship in Erie. In 1820, Niagara was sunk in Misery Bay on Presque Isle for preservation. She was raised and restored for the 1913 centennial of the battle. She was subsequently rebuilt in 1963 and again in 1990. The Niagara is the official ship of the state of Pennsylvania. Location. 42° 7.153′ N, 79° 58.9′ W. Marker is in Erie, Pennsylvania, in Erie County. Marker is on Aquarius Drive west of Jordan Road, on the right when traveling west. Touch for map. Marker is at or near this postal address: 5033 Jordan Road, Erie PA 16510, United States of America. Touch for directions. Other nearby markers. At least 8 other markers are within walking distance of this marker. Lawrence Hall (within shouting distance of this marker); Somers Hall (about 700 feet away, measured in a direct line); Yarnall Hall (about 700 feet away); Caledonia Hall (approx. 0.2 miles away); Turner Hall (approx. 0.2 miles away); Packet Hall (approx. 0.2 miles away); Elliott Hall (approx. 0.2 miles away); Scorpion Hall (approx. 0.2 miles away). Touch for a list and map of all markers in Erie. More. 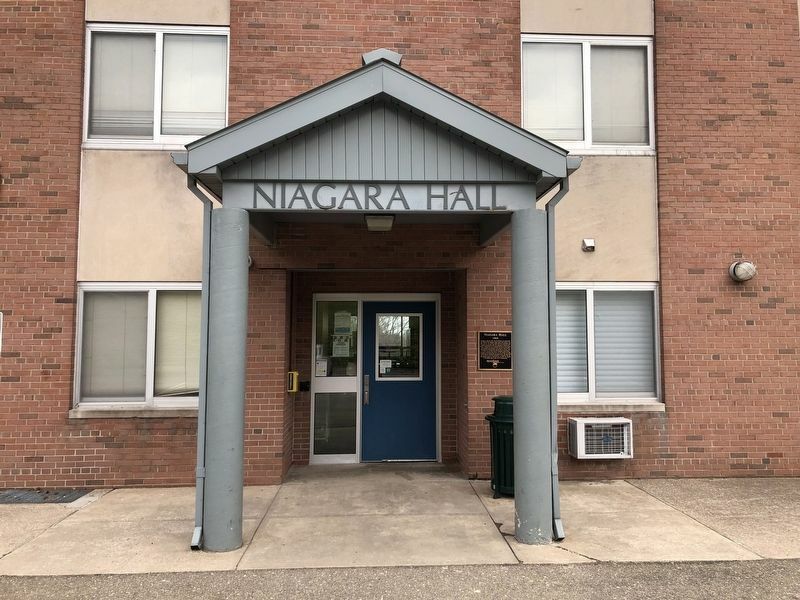 Search the internet for Niagara Hall. Credits. This page was last revised on April 15, 2019. This page originally submitted on April 15, 2019, by Devry Becker Jones of Washington, District of Columbia. This page has been viewed 29 times since then. Photos: 1, 2. submitted on April 15, 2019, by Devry Becker Jones of Washington, District of Columbia.